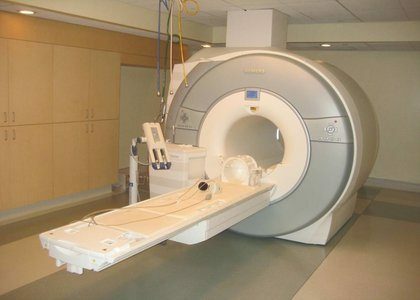 Magnetic resonance (MR) images are taken so that a clinician can view various tissues inside the body. Often, they are taken without a contrast-enhancing agent, but four in ten MR procedures require injection of a contrast agent to view anatomical structures and indications of disease or injury. All currently approved contrast agents contain a chemical element gadolinium, which is toxic in its free form.Researchers at Massachusetts General Hospital (MGH) in a bid to find an alternative to currently used contrast agents for MRI have found that the experimental alternative, a manganese-based compound, performs as well as approved contrast agents. Their study appeared online Nov. 15, 2017, in Radiology. Previous studies in mice had shown that the manganese-based compound did not leave traces in tissue and that the liver and kidneys eliminated more than 99 percent of the contrast within 24 hours. MRI showed that the baboons’ kidneys and livers efficiently excreted the manganese-based contrast agent. The researchers did not find traces of manganese accumulation in tissues.